The Short Version: Founded in 1879, the Bowery Mission is a nonprofit organization committed to assisting homeless and impoverished individuals in New York City. The heart of its mission is to give people struggling in life the opportunities and resources they need to recover, improve, and succeed. The team’s compassionate and consistent care has made a difference in the lives of countless men, women, and children in need, and you can join this good work by becoming a volunteer. Whether you’re pouring bowls of soup or mentoring at-risk youths, you can make a difference in the community alongside the passionate and altruistic people who work at the Bowery Mission’s shelters. Once you get involved in these programs or events, you can build deep human connections by sharing your experiences, uniting behind a common purpose, and lending a hand to the good work. When Alexandra’s husband fell ill in 2012, she felt overwhelmed by the sudden challenges facing her family. Her days became dominated by anxiety and fear, and she longed for a way to bring some positivity back into her life. That’s why she started volunteering. Alexandra served meals at the Bowery Mission during the weekend as a way of reminding herself what’s important in life. As she got to know the homeless people who visited the shelter, she wanted to do more to assist them in the long run. With the encouragement and support of knowledgeable staff members, she developed a writing workshop for women in the residential program at the Bowery Mission Women’s Center in Harlem. To this day, dozens of women use this creative outlet to express themselves and get in touch with who they are and what they value in life. The group became a transformational way for women to come together, learn, and grow through self-expression. Volunteerism often leads to lasting human connections between members of the community. You can witness many touching stories, like Alexandra’s, by getting involved in the Bowery Mission’s volunteer-driven programs and events. Since 1879, this nonprofit organization has led the fight against homelessness in New York City by providing free aid to thousands of men, women, and children. The Bowery Mission is a nonprofit organization that gives hope to homeless and at-risk individuals. Each year, over 10,000 volunteers give back to the community by serving hot meals, mentoring young children, donating money or clothing, and lending a helping hand in a variety of ways. You can search online for upcoming volunteer opportunities and make a difference in people’s lives while meeting wonderfully caring and selfless individuals in New York City. When you become part of such a meaningful, altruistic mission, you open yourself up to experiences that can change your heart as well as your outlook on the world. Volunteers have many ways they can contribute to the health, happiness, and welfare of homeless people in New York City. Amy told us the most common volunteer service is serving meals at one of the shelter locations. The team serves a hot breakfast, lunch, and dinner every day, and it takes a lot of manpower to get food on everyone’s plates. In 2017, tens of thousands of volunteers helped the Bowery Mission serve 653,500 warm meals. You can sign up to volunteer on your own or in a group and spend a day doing something good alongside people who care about making the world a better place. The Bowery Mission relies on a network of over 10,000 volunteers working to reduce poverty and homelessness in New York City. By providing transitional housing, hot meals, summer camps, and a range of other programs, the Bowery Mission helps people overcome personal challenges and get back on their feet. Amy told us the team takes intentional steps to watch out for those in need and make sure they get help and stay on the path to recovery. The nonprofit has 178 active alumni who keep in contact with the team while they get back on their feet. “We’re helping them, wherever they’re at in their journey, to make the right steps forward,” she said. If this sounds like a cause you want to support, you can make a donation online or contact the Bowery Mission to find out how you can get involved. In January 2018, the Bowery Mission combined forces with two other rescue missions, one in New York and one in New Jersey, to build a collective impact on homelessness in the Northeast. The three missions recognize that they can always improve — from making renovations to creating new youth programs — and they are committed to continue growing and learning for years to come. Throughout the year, the Bowery Mission organizes many charitable events to raise awareness and funds for the homeless, but there are a few large, noteworthy events that every philanthropist in New York City should circle in their calendars. First up is the Valentine Gala, a favorite event for many staff members because it takes place on Valentine’s Day. This signature event gives people a chance to dress up, enjoy a fancy night out, and give back to the community. The night includes a black-tie dinner and a night of dancing to live music. In 2018, the 29th annual Valentine Gala featured performances by the Hank Lane Band. In April, charitable donors, volunteers, and other generous people can attend an Inspiring Hope Spring Benefit Lunch, which features the stories of women who changed their lives thanks to the Women’s Centers. During the lunch, you can see the impact of the Bowery Mission’s good works and learn more about how you can get involved. 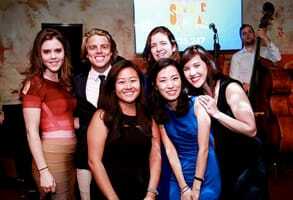 Young professionals and philanthropists come together at the Bowery Mission’s Summer Social. The Young Philanthropist Summer Social is always great for young and generous individuals to network with one another. It’s a friendly social atmosphere where attendees make new acquaintances and bond with people based on common interests and values. Amy said most attendees are young professionals who want to make a difference in the world. Lastly, the Celebration of Hope auction in October is a dynamic evening of music, laughter, and fundraising. The silent auction always gets people excited, and many of the prizes are well worth bidding on. Amy told us tickets to the Broadway musical”Hamilton” were one of the most bid-on items at 2017’s auction. At a Bowery Mission event, you can mingle with a crowd of people who understand the importance of helping others and serving the community. 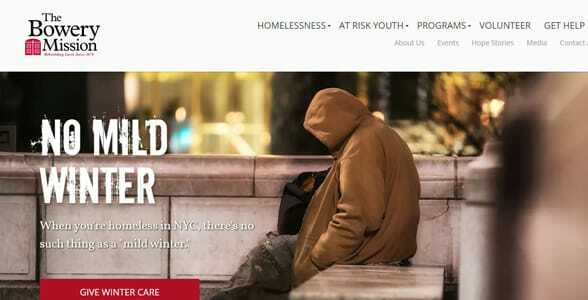 The Bowery Mission has an undeniably positive impact on New York City’s homeless population. In 2017 alone, the organization provided 13,300 showers, 167,300 nights of safe shelter, 46,400 articles of clothing, and 1,300 onsite medical, dental, and optometry exams — all for free. The reason the team can do so much is because so many folks pitch in and volunteer every day. The volunteers and staff members feel energized when they see residents and visitors take steps to improve their lives and sustain that progress over time. You can read dozens of inspirational stories on the site and see the human face behind the homelessness problem in the US. The Bowery Mission helps people who face many obstacles — including drug addiction, alcoholism, depression, and abuse — so they can live healthy, fulfilling, and successful lives. Many people have found the strength and courage to change their lives because of the Bowery Mission. Who wouldn’t want to be part of that story? There’s a lot you can do to help local men, women, and children get on the right path and make good decisions for their future. “Whenever someone makes the choice to give of themselves for the benefit of others, they not only experience the impact in that moment, but there’s an ongoing shift of perspective that allows you to live a life that’s a little more full and more joyful,” Amy said. When Alexandra chose to give back, she changed her life as well as the lives of the women in her writing program. Volunteering gave her the strength to heal her own heart while also providing relief and comfort to others. Through acts of service, we show the best side of ourselves and bring out the best in others, too. 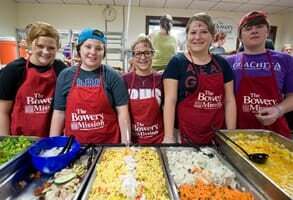 You can surround yourself with selfless and interesting individuals by becoming a regular volunteer at the Bowery Mission. Volunteers at the Bowery Mission have fun while making a difference in people’s lives. 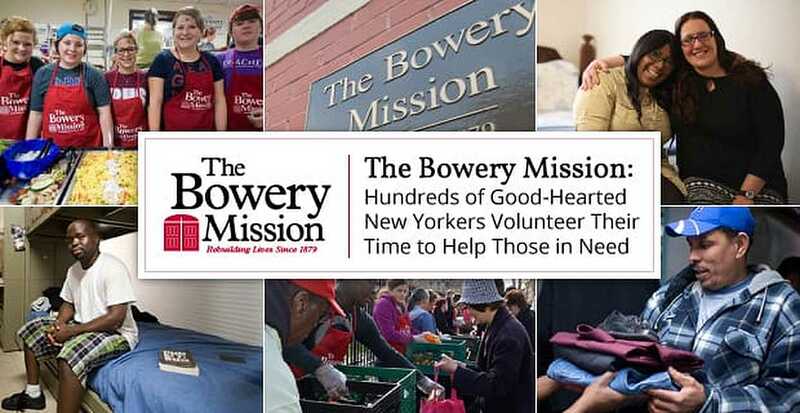 The hands-on experience of volunteering with the Bowery Mission allows singles and couples to recharge their batteries and meet compassionate people in their neighborhoods.